One of the main criticisms opponents have lobbed against New York’s new gun bill is that it was rushed through in the dead of night, without proper time for debate or discussion. The reason for the rush, Gov. 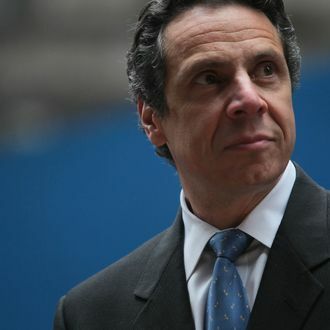 Andrew Cuomo said at a press conference on Tuesday, was not to sneak the legislation through but to make sure it could achieve what it set out to do: Reduce the number of assault weapons in the state. “If we had made that announcement and then waited for three days we believe you would have seen an unprecedented period possibly of people buying assault weapons before the law was passed just to get in under the wire, if you will.” And he’s right. Even in the 24 hours during which the details of the legislation were public but the bill hadn’t yet been signed, customers mobbed gun stores, lining up to buy even guns not covered by the ban before it went into effect on Tuesday afternoon. The president already made a similar point on Monday, saying “it is obviously good for business” for firearm manufacturers to have people afraid the government is going to come confiscate their guns. And how.